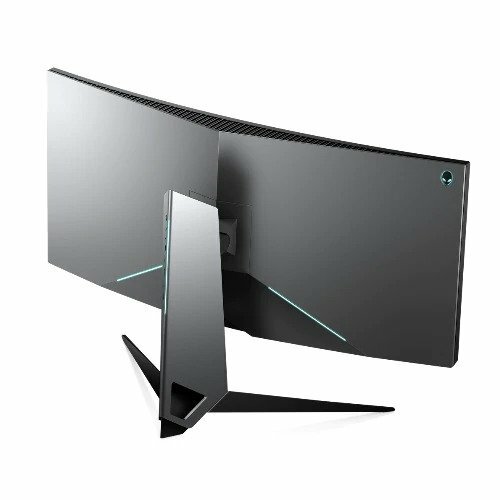 There is a reason why Dell backed Alienware entered the market with its gaming-centric display monitors despite the fact that the parent company has already been fabricating some dope quality PC monitors. For finding out the same, today we have the Alienware AW3418DW ultrawide gaming monitor in our house, ready for an in-depth analysis of how well it is cooked by the company. For an immersive gaming experience, you will need a monitor that packs a large and sharp display with good viewing angles in addition to your power-packed cabinet. This 34″ ultra-wide monitor from Alienware sits right in the sweet spot for gamers, making it one of the worth considering options. So without any further ado, let’s dive straight into the Alienware AW3418DW Review. The Dell Alienware AW3418DW literally looks like a treat for gamers. The large form factor aided by a curved screen and relatively small bezels make it look unique and futuristic. The stand is deep enough at 319mm and looks fairly well, inspired by the design of a spaceship, further adds to the looks and reduces the clutter through better cable management by routing the cables through the stand, which makes things look minimal and tidier. Being designed specifically for gaming, it does bear LED lighting stripes running along the monitor’s rear panel, stand, and the down-facing lights on the underside that can be customized to glow in any color as per your choice via AlienFX software. Alienware has also included a plethora of gaming presets for picture settings, game settings and a dedicated ComfortView setting for filtering blue light, helpful when you are gaming at night and don’t want it to affect your eyes or sleep quality. The lights are not that pronounced though, but add a cool subtle profile to your gaming rig in dark. Moreover, the bezels max out at a mere 0.4 inches, resulting in an overall immersive experience, followed by the air vent along the top border as a provision for better heat dissipation. As far as the ergonomics are concerned, one can adjust the monitor’s height, gyrate it left and right and lean up and down with ease, however, it doesn’t have the ability to rotate for a vertical portrait view which might be a bummer for some, but can be ignored as most of us won’t do that in an ultra-wide gaming monitor, that too with a curve to it. Overall, the high-quality plastic back and robust metal stand have no compromises regarding durability. Except for minor stability issues due to wobbling, we didn’t feel any issues whatsoever regarding design and build quality. The Dell Alienware AW3418DW has a plethora of necessary ports located at the back, bottom edge as well as the underside. The rear houses the HDMI 1.4 and DisplayPort 1.2 for connecting PC or laptop. Furthermore, we have two USB 3.0 Type A ports and a USB 3.0 Type B port for connecting accessories. At the bottom bezel, you get two more USB 3.0 ports along with a headphone jack (placed at the best possible position for ease of access) which makes it even more convenient if you got tons of accessories to play with. There are a total of six physical triangle shaped navigation buttons for controlling everything, making it easier switch game modes, overclock the display or adjust brightness and contrast. The main menu gives access to all the technical settings to be tweaked like changing LED colors and brightness, also, we do have an option to personalize the keys for shortcuts of things you want on your fingertips. The power button resides nearby with an LED indicator embedded in. It is an absolute pleasure to play games, watch TV Shows and Youtube videos on the Alienware’s large 34-inch (3440 x 1440) IPS curved display. The screen also bears an anti-glare coating on top to avoid glares and unwanted reflections. The brightness maxes out at 270 nits, better than the industry average of around 300 nits, making it fairly bright for almost anyone out there. This monitor produces an impressive 127.2 percent of the sRGB color gamut space, outperforming other contenders from brands like Acer and BenQ, resulting in accurate and vibrant colors for most of the part. The colors pop well and endure the pleasure of looking at the display during long gaming sessions. The 178-degree wide field of view on this curved panel ensures that you see each and every enemy approaching towards you, believe me, it does help for an easy win. You can keep a look at tiniest of the detail on each and every corner of the field. The response rate is pretty fast and latency is low as well, allowing you to perform complex actions within the time frame resulting in utter satisfaction while playing games like CS Go, Injustice 2, Destiny 2 and PUBG. The high refresh rate of 120Hz followed by 12.9 milliseconds of latency and a quick response time of 4ms, makes things look even smoother when coupled with Nvidia’s G-Sync. The motion blur control is excellent too means only a small blur will trail the image which won’t affect the user experience much. Barring everything that’s good, we discovered that it suffers through the screen bleeding issue which is usually evident in IPS LCD panels. The backlit bleeds from the corners of the screen, however, it is only noticeable in black scenes, without hampering anything while gameplay. Also, it is worth noting that the screen bleeding issue might vary for each unit, so it should be easy for you not to take this symptom as a deal-breaker. Also, keep in mind that the contrast ratio on this monitor ain’t that good (approx 900:1) and backed by poor black uniformity, it hampers the multimedia experience in the darkroom when compared to the competition. Lack of HDR support is another con. Coming to the inbuilt gaming presets, Alienware AW3418DW packs three modes specifically for gaming that includes an FPS mode that cranks up the brightness, an RTS mode that makes the display look more vibrant and saturated, along with an RPG mode that results in deep blacks for a cinematic experience (OLED fans would love this). If you are fond of playing those horror games or games with dark scenes, you can toggle Dark Stabilizer which improves the overall dynamic range of the playback, brightening up the dark areas while maintaining the bright ones. 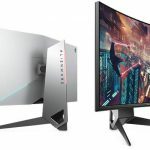 The Dell Alienware AW3418DW is a really good and futuristic looking gaming monitor especially for those looking for a large 34″ display size and crisp 3440 x 1440 resolution. It provides great image quality, sharpness, faster response time, display overclocking and a good dynamic range, making it a good choice as an all-rounder which can be used for gaming, for editing media, watching media and for office purpose. The flicker-free backlit, exceptional color quality and wide viewing angles are an added advantage. However, not everything is perfect which is the case with others too. This monitor falls short on grounds of color contrast which is slightly lower in actual than promised. Also, the lack of HDR support and poor black uniformity might be a dealbreaker for some. Overall, its a great choice unless and until the sole purpose is to get deep color contrasts while enjoying movies in dark.